There were a number of notable firsts in the 1964-65 Topps Hockey set. It was the first time all the teams in the NHL were included in a Topps issue. It was also the first time the company printed more than 100 cards in a complete set. 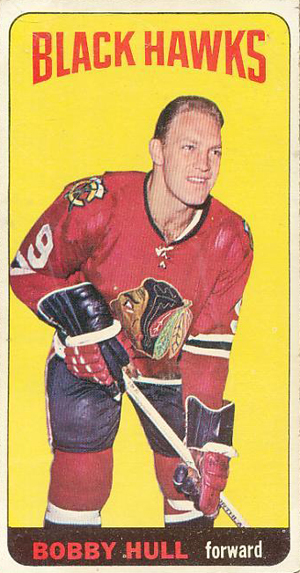 Most notably, though, 1964-65 Topps Hockey was the first time they used the Tall Boy format in a sports card set. The biggest distinction about the cards is the larger size. They measure the same 2 1/2 inches as standard cards, but are more than 4 1/2 tall. The bigger size allows for a large picture of a player, with the team name above and the name and position below. The team name is presented with a curved bottom edge, and the information at the bottom is inside a solid-colored strip. A white border surrounds the card, with the corners of the main area rounded. The backs have a card number inside a black circle, with the player's name stretching outward. The team name and position appear below the name, with a single line of stats from the previous season. A short biography on the player follows, along with a French translation. On the right side is a cartoon about the player, with a bilingual caption. All six NHL teams are included in the set, with players scattered throughout the set, rather than in series like in previous years' sets. Most teams are also represented by their head coaches. Two cards midway through the set feature checklists, and the final six cards name All-Star players. The set was printed in two series, with cards 55 and higher making up the scarcer series. As a result of the uneven distribution of the cards between the series, 11 Series 2 cards were short-printed. Notable rookie cards in the set include Marcel Paille, Gary Dornhoefer, Pit Martin, Roger Crozier, Jim Pappin, Rod Seiling and Lou Angotti. Other key cards in the set include the All-Star cards of Tim Horton and Stan Mikita, which are among the short-prints. 1964-65 Topps #68 Jacques Plante - SGC 96 Gem Mint corners. Fantastic color! 1964-65 Topps #63 Bob Leiter - SGC 96 Gem Mint corners. Low Population! 4 stars, great pictures and info. Only needed now is a contact to sell our items to. I have a complete set of the 110 tall boy cards. Medium to mint condition.